Belagavi City’s Dr. B R Ambedkar road which is house to the most top notch brands in textiles is now getting ready for a makeover. 3.45 crores have been allocated under the CM’s special 100 crore funds for the makeover. From Chennamma Cricle to BIMS the entire road will be free from poles and the electric cables would be laid underground, and some of this work has already been done. The entire cost of this would be about 1.2 crores for UG cabling and shifting of poles. Footpaths on both the sides of the road would be developed with a cost of Rs.80 lakhs and new median street lights will adore at a cost of Rs.80 lakhs. The median will host plants and also the footpath in some locations would have plants. 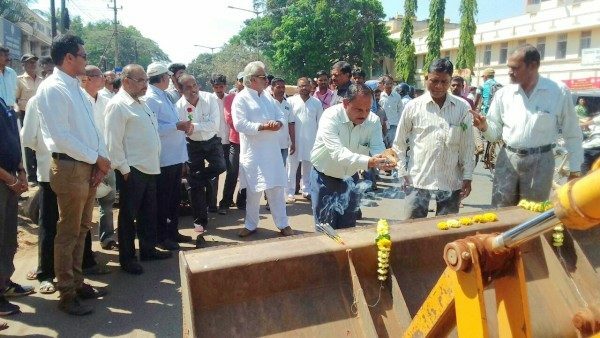 MLA Feroz Saith said that the project will be completed before the monsoons and this road will be a model road in the city. Great work by our honorable MLA sir feroz sait…….. Widened roads r used as auto stands.Plese ensure that doesn’t happen. Please ensure that the footpaths are.used to walk and not park vehicles or used by hawkers. It’s a pain to see the condition of.yhe road sides during peak hour traffic with private buses and autos taking half the road for parking.